You’ve been waiting for it, and it’s almost here: Mages of Mystralia is launching on consoles. 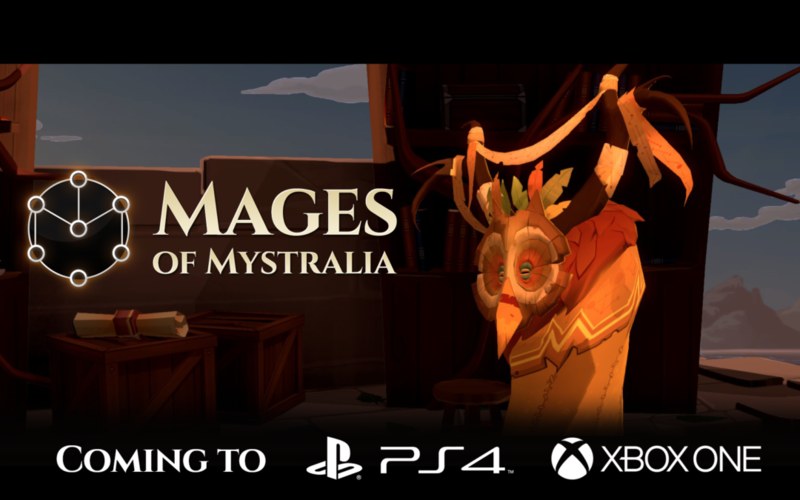 Bringing Mages of Mystralia to PS4 and XBox One was a first in developing for consoles for most of the team, and we’re very proud to be part of this adventure. The official release date on PS4 was announced last week. Mark the day: August 22, 2017. Read more about it on PlayStation’s blog. The Xbox One version is in the final certification stages, we’ll confirm the release date soon. For an indie studio, porting a game to consoles isn’t a small matter. Each platform has specific requirements and its own certification process. It’s also a huge challenge to work on porting to two consoles at once, especially considering the size of our team and the small number of programmers at Borealys – there’s only three. (Shout out to our technical team for their hard work and dedication!) This is why we couldn’t release the console versions at the same time as the PC one on Steam; we wanted to ensure that players got an optimized version for their favorite consoles. According to them, if we could narrow it down to just two words, it would be “performance” – PCs are usually stronger than consoles, so we had to optimise at every step, they say – and “learning”– there isn’t a lot of open resources for console development, like there is for game engines and PC development. This means that they had to dig through official documentation, rely on trial-and-error, and figure it out along the way. What’s great is that it brought the studio members closer together. We got to face and surpass a new challenge as a team and bring our game to new heights. Until next time, join us on Discord or leave us a tweet at @BorealysGames or @Mystralia. Once you have finished porting to the PS4 and the XBox One, is porting to the Nintendo Switch something you would consider? What would you see as the challenges there? Hello Andy. Thank you for your comment. As you may already know, console launch for PS4 and Xbox One is coming this week. We still have to go through some certification for countries that require a different evaluation, but this is well on the way. As for the Nintendo Switch, it’s definitely something we’re looking at, but we cannot confirm anything at this point. For now, we are focusing on PS4 and Xbox launch, as well as the new Archmage Mode update also coming this week. It would put undue pressure on our programmers to tackle yet another console at the same time as handling post-launch and the major update. We’ll be sure to inform the Mystralian community if and when we have news for a new console.